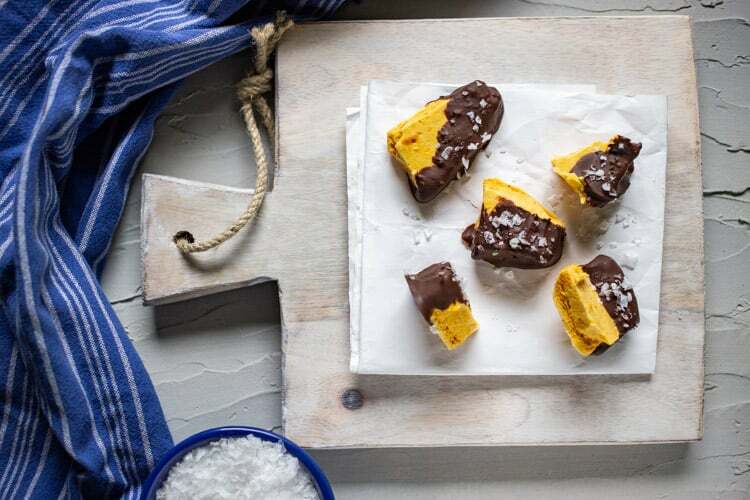 An easy recipe for homemade honeycomb candy: chewy, crunchy, airy, caramel-like honeycomb pieces dipped in chocolate and topped with sea salt flakes. [social_warfare] This post may contain affiliate links. See my disclosure policy here. My parents went on a trip to Australia and all they brought me back was a bag of candy. Actually, they also gave me an awesome pair of slippers, but I was even more excited about the candy because it brought back so many memories and tastes from childhood. Growing up in Australia and Papua New Guinea one of my favorite Aussie candy bars was Violet Crumble. 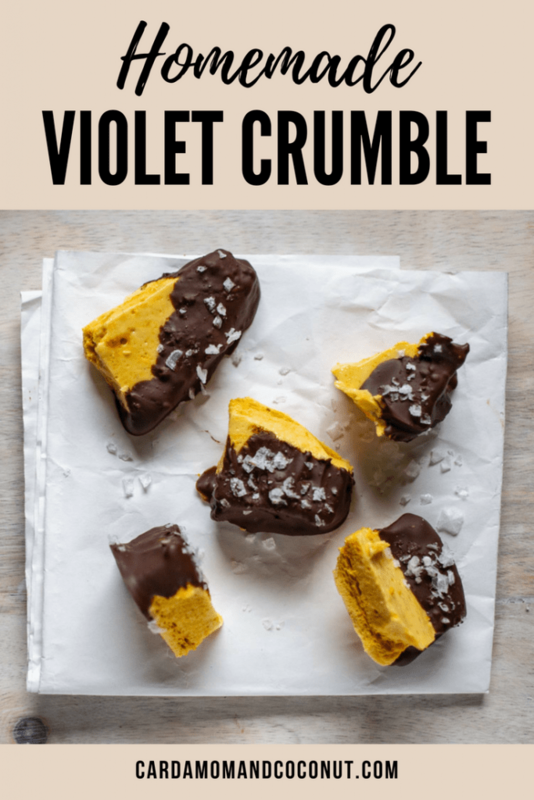 Violet Crumble is similar to a Crunchie bar, and is also known as honeycomb candy, sea foam candy, or sponge candy in the US. 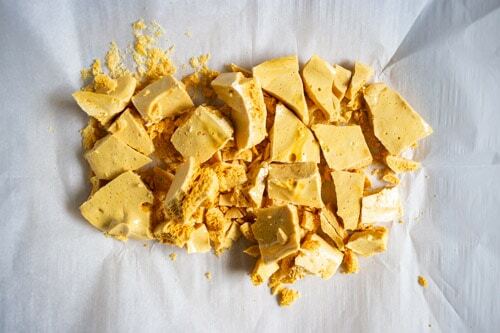 The candy has a crumbly honeycomb toffee center with a chocolate coating. It’s also incredibly easy to make at home, I can’t believe I didn’t try this years ago! With this recipe it’s important to prepare your tools and ingredients before you start. Line a loaf pan with parchment paper, grab a whisk and candy thermometer, and measure out your baking soda. Mix together the sugar, corn syrup, honey, and water in a medium to large saucepan. The mixture will bubble up a lot, so use a larger pan than you think you need. Whisk the ingredients in the saucepan together, add the candy thermometer to the pan, and heat on the stove over medium heat. You can stir occasionally, but shouldn’t need to stir much after the sugar has dissolved. Heat the sugar mixture to 300 degrees F, then remove the pan from the heat, take the candy thermometer out, and add the baking soda. Whisk the sugar mixture together with the baking soda. When added to this hot liquid, the baking soda decomposes into carbon dioxide and water. The carbon dioxide is what forms the bubbles and makes the candy airy and not heavy like caramel. When the mixture stops bubbling, immediately pour into the prepared pan with parchment paper. It doesn’t really matter if it’s spread out perfectly since you’ll be breaking the candy into small pieces anyway. 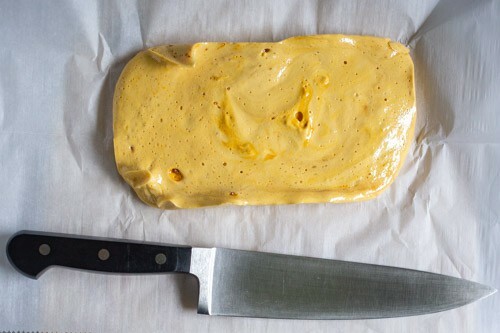 Allow the candy to cool for at least 30 minutes, then break the pieces apart on a cutting board with a knife. 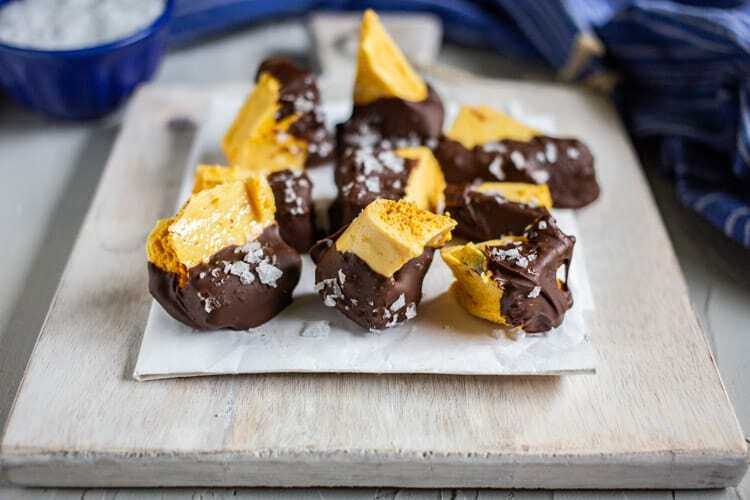 Melt your chocolate, dip the honeycomb pieces in chocolate and sprinkle with sea salt flakes. Allow the chocolate to harden and then serve. You can also store for a few days, just make sure to store in an airtight bag. You can easily double the recipe by doubling the ingredients and using an 8 or 9 inch square pan instead of the loaf pan. Good quality sea salt flakes are key to this recipe. My husband brought back this Jacobsen sea salt from a trip to Oregon and it’s been my favorite finishing salt ever since. Maldon sea salt flakes are another more economical option. You’ll also need a candy thermometer. I bought mine years ago, but this one is pretty similar to the one I use. I like that you can adjust the height based on the size of the pan. 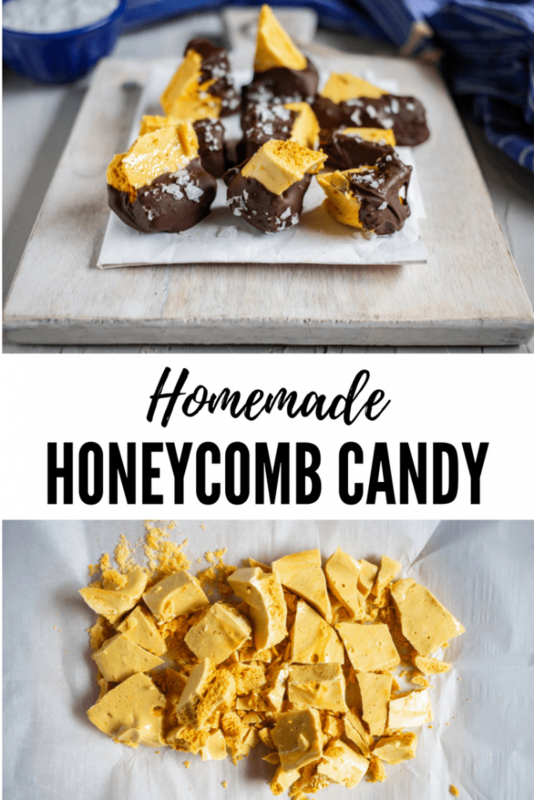 If you try this recipe for homemade honeycomb candy, leave a comment and review below and let me know how you like it. Or pin it here to save the recipe for later. Looking for another Australian recipe to try? Check out these Aussie Vegetarian Sausage Rolls. 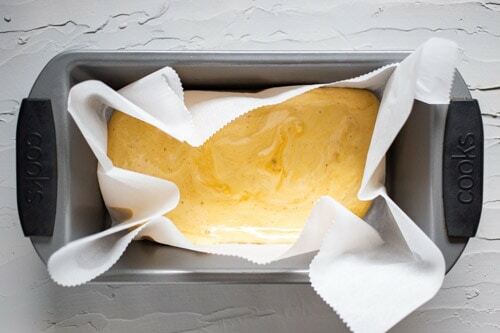 Prepare a 9x5 loaf pan with parchment paper. Measure out the baking soda in a small bowl. Grab a whisk and candy thermometer and set aside. Add the sugar, corn syrup, honey, and water to a medium to large saucepan. The mixture will significantly increase in size when you mix in the baking soda, so go a bit larger than you would normally use. Whisk the ingredients together, place on the stove over medium heat, and watch the mixture closely. You can stir if you want, but you don't need to stir much once the sugar has dissolved. Insert the candy thermometer and heat the sugar mixture to 300 degrees F. This should take five to ten minutes. Then remove the pan from the heat, take the candy thermometer out, and immediately whisk in the baking soda. Once the mixture has stopped foaming, pour right into the parchment paper lined pan. Set aside for an hour. Melt the chocolate in a microwave safe bowl by microwaving for 30 seconds at a time and then stirring. 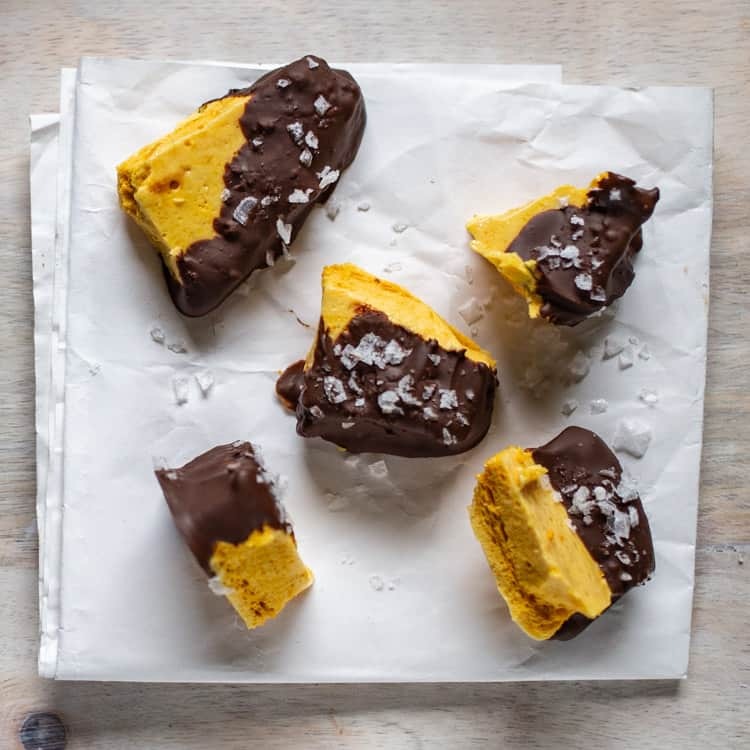 Break the honeycomb candy into pieces using a large chef's knife, dip into the chocolate, and sprinkle with sea salt flakes. Allow the chocolate to harden and then serve. Store leftover candy in an airtight bag. This recipe can easily be doubled. Just double all of the ingredients and use an 8 or 9 inch square pan instead of the 9 x 5 inch loaf pan. These look irresistible. I would probably sit there and gobble half the pan up! I love the little bit of salt you topped them with to bring the flavors out even more. These candy bites look delicious and how interesting with the honey flavor!! Sounds so yum!! Did you know that dad used to work at Rowntree Hoadley making Violet Crumble? He used to get me a bags of rejects on a regular basis. I did not know that! How interesting! I would have loved Violet Crumble rejects. Oh I’ve never heard of these before but they sound soooo delicious! What a great gift to bring back – I can’t wait to try them! I just saw Violet Crumble candy bar at the store but wasn’t what it was. 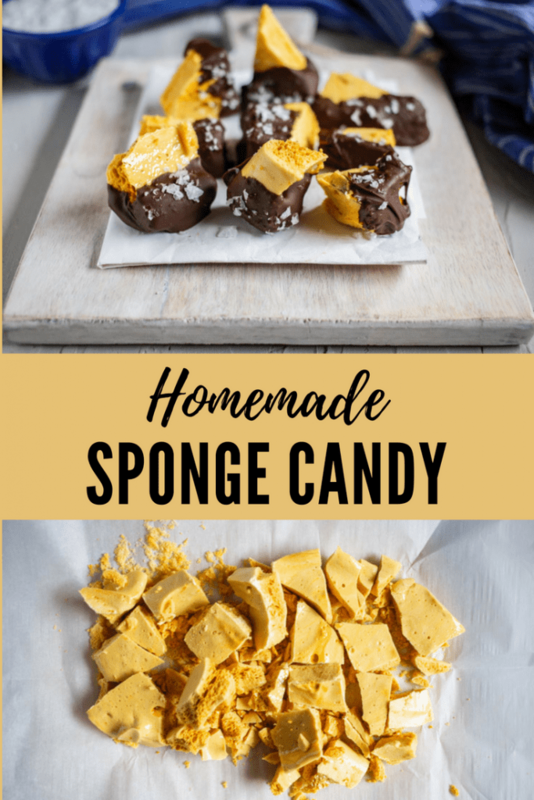 I really enjoy making candy and this is a must try. I know exactly what candy this is! I can’t believe you can make it at home and so easily! I need to try this! The texture looks amazing! This would make a perfect gift. What a treat. I love your addition of sea salt on the chocolate for a thoroughly modern and grown up flavour boost. We always make chocolate dipper honeycomb at Christmas, but this is making me want to make it sooner! What an interesting candy! I have never heard of this, but I’m definitely intrigued to try it. The method sounds pretty unconventional and that always gets my curiosity up to try something new. Thanks for the tip on the finishing salt, too! Oh, they looks so light, airy, and crispy! I am totally drooling! Oh I remember making this with my grandma. It sure brings back some great memories. 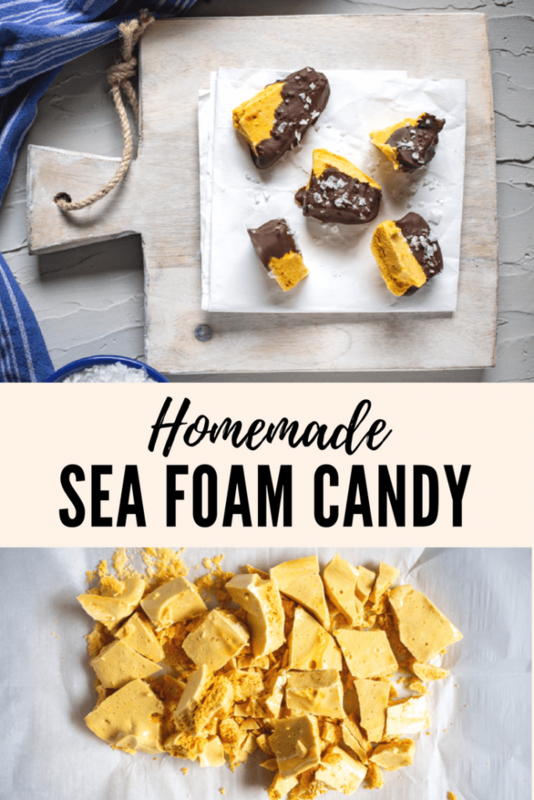 What a fun candy to make!! I tried your recipe to the T. It tasted good but my boyfriend said the middle has a bitter coffee like taste. What do you think I did wrong? Or did anyone else had a problem like mine? Maybe I need to redo one more time. Texture and all are perfect. 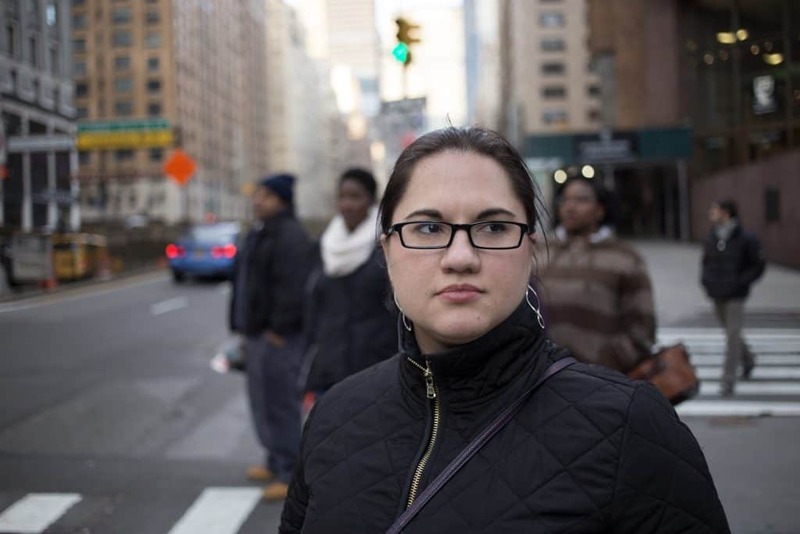 Sylvette – a couple of thoughts: 1) it could have been slightly overcooked, leading to a slight bitter, burnt, coffee-like flavor? 2) maybe it’s the baking soda that he’s tasting. To overcome it, you could potentially break into slightly smaller pieces and coat in a bit more chocolate, maybe fully dip the pieces in chocolate rather than just part of them? Let me know how it works out!